Spring has arrived and nicer weather is on the way. Sunny days are the perfect invitation to go on walks with our dogs. 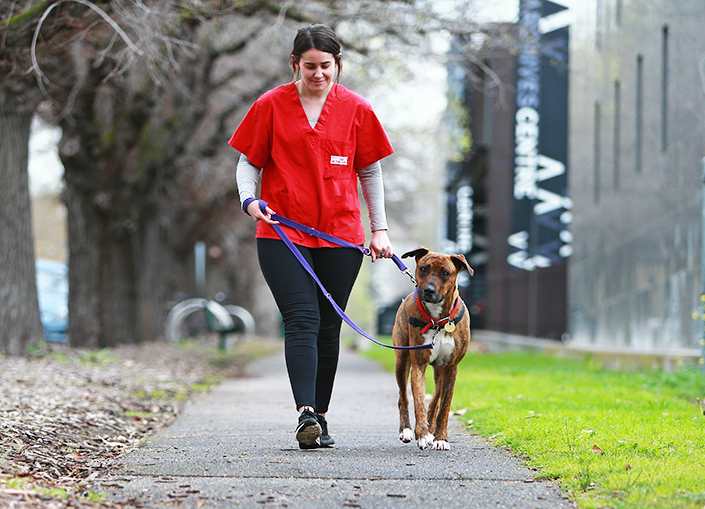 Before you hit the pavement with your pooch, it’s a good time to remind them how to walk nicely on lead. Think you can’t train your dog to walk on a loose lead without uncomfortable equipment, such as a correction chain? Think again! Using a force free rewards-based method will teach your dog that staying close to you is the nicest place to be, setting you up for enjoyable walks. Not sure how to teach your dog to walk nicely on lead? Follow these simple steps and they’ll soon become the envy of the neighbourhood. Before you start training, it’s important to prepare some tasty treats that your dog will love. Step 1: Fit your lead and begin with your dog facing you. Step 2: Take one or two steps away from your dog. As your dog moves toward you, reward them with a tasty treat. Step 3: Begin to move in different directions and reward with a tasty treat as your dog moves with you. Step 4: When your dog is following enthusiastically, you can turn your body to the side and encourage your dog to walk beside you. Remember to frequently reward with a tasty treat to keep your dog engaged. Step 5: Gradually increase the number of steps taken in between rewards. If your dog disengages, it’s likely you have waited too long before rewarding, so give treats more frequently again for a while. Step 6: Take tasty treats with you when you go on walks. Reward intermittently to ensure your dog is reinforced occasionally for their lovely loose-lead walking. Remember: When training your pet, only ever use positive reinforcement training techniques. That is, rewarding your pet for good behaviour. Never punish your pet for doing something wrong or not doing what you’ve asked. Punishment is not an effective training method and can cause fear and distress to your pet. View our behaviour and training resources for more information on training your pet. For advice specific to your pet, or if you need help with training, please consult your vet or a professional trainer.